LAS VEGAS—HARMAN Professional Solutions, the global leader in audio, video, lighting and control systems, including networked AV, today announced Allied Esports is leveraging cutting-edge HARMAN Professional audio, lighting and control solutions at Esports Arena Las Vegas, which celebrated its grand-opening on March 22, 2018 at the Luxor Hotel and Casino. 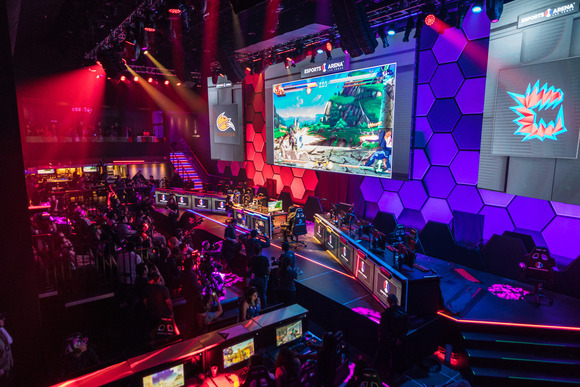 The new Esports Arena Las Vegas is a 30,000-square-foot multi-level arena with a competition stage, telescopic seating, daily gaming stations, VIP room, two bars, and state-of-the-art streaming and production studios. The facility also features an interactive area known as “The Dome” that includes retro games, and a front lobby equipped with gaming stations, a streaming booth and a virtual reality station. In order to provide a world-class audiovisual experience at the new arena, Allied Esports formed an exclusive partnership with HARMAN Professional Solutions to provide a custom audio, lighting, and control solution made up of JBL Professional loudspeakers, Crown amplifiers, BSS audio processors, AMX control systems and Martin lighting fixtures. The opening ceremony at Luxor Hotel and Casino featured a series of events designed to showcase the arena's impressive production quality and interactive entertainment, with more than 20 professional esports players and 500 local gaming influencers in attendance. Highlights included an opening night of show matches between SonicFox vs. GO1 and Rogue vs. Ghost Gaming in Rocket League®, and eUnited vs. Spacestation in SMITE as well as the weekend launch of fighting game tournament Smash Masters League featuring Super Smash Bros for Wii U. World-renowned chef José Andrés also held a discussion about the custom gaming-inspired menu that the ThinkFoodEntertainment team created for Esports Arena Las Vegas.